term used to describe the symptoms commonly associated with degenerative arthritis of the 1st MTP joint. Coughlin Classification (Coughlin MJ, J Bone Joint Surg Am. 2003 Nov;85-A(11):2072). Grade 0: xray normal. Exam=10%-20% decreased dorsiflexion. No pain. Treatment = plantar release. Intra-articular sodium hyaluronate or steriod injection. @50% will still require surgery. (Pons M, Foot Ankle Int 2007;28:38). Hallux MTP Arthrodesis (Goucher NR, Foot Ankle Int 2006;27:869). Arthrodesis: 7% cellulits, 6% plate removal due to pain, 6% painless fibrous union. 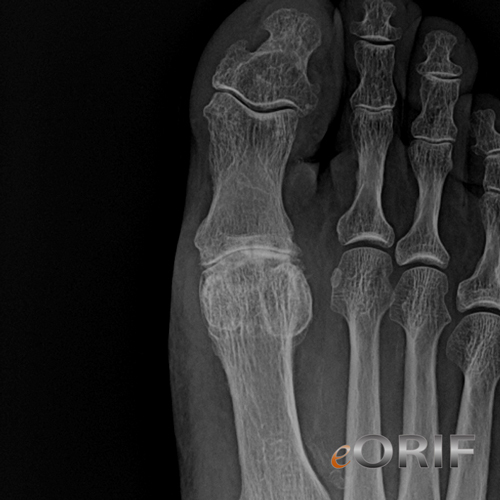 Arthrodesis=WBAT in stiff-soled shoe on lateral aspect and heel until radiographic fusion. 3 months for maximal improvement. 87% Excellent, 13% Good, O%fair/poor subjective patient result. Coughlin MJ, Shurnas PS. Hallux rigidus. Grading and long-term results of operative treatment. J Bone Joint Surg Am. 2003 Nov;85-A(11):2072-88. Giannini S, Ceccarelli F, Faldini C, Bevoni R, Grandi G, Vannini F. What's new in surgical options for hallux rigidus? J Bone Joint Surg Am. 2004;86-A Suppl 2:72-83.